The coalition agreement has less than 226 signatures. 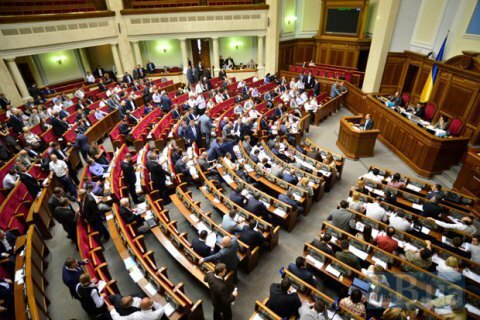 The coalition of factions in the Ukrainian parliament fell apart de jure on 24 March since the coalition agreement no longer has 226 signatures, one of the leaders of the People's Front faction, Viktoriya Syumar, has said. "Oleh Lyashko let Volodymyr Hroysman know that he is recalling the signatures of his deputies from under the coalition agreements. Thus there are fewer than 226 signatures and the participant of the meeting agreed that the existence of the coalition was very doubtful," she said. According to Syumar, the People's Front is not going to form a coalition with MPs who voted for the so-called 16 January "dictatorship laws" and the Opposition Bloc. It may form a "coalition of two" with the president Petro Poroshenko Bloc but does not deem it the best option, she added. De facto there has been no coalition in the Ukrainian parliament since 17-18 February 2016 when Self-Help and Fatherland left it.